Haritalika Teej Quotes Nepali, Teej Quotes 2076, You will get All Teej Quotes, Wishes, SMS, Teej Images for wishing your friends. You will find all Best Teej Quest in the Nepali Language as well as Teej wishes in English. We try to post Best Haritalika Teej Quotes. But before you Share and wish your friend, you must know about Nepali Teej Festival. Here are some very interesting things about Teej. 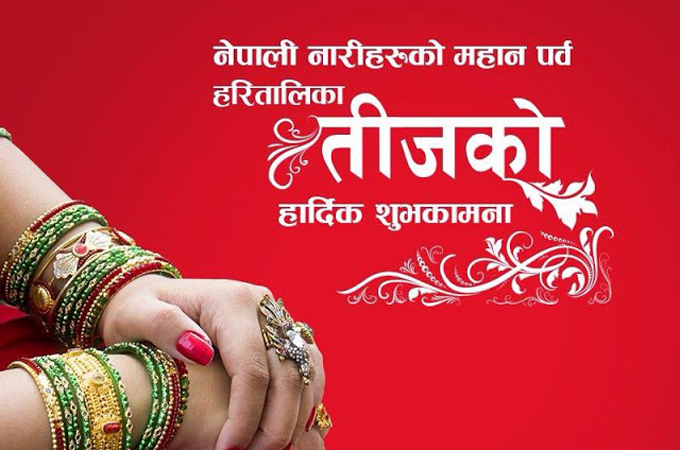 Haritalaika Teej /Nepali Teej – Teej Brata, which is fall in August or September, is the colorful Festival of Woman. Human reds of Millions of Nepali women, all dressed in the striking dress of various hues of red, gather on the banks of the Bagmati at Pashupatinath. Married women wear their scarlet and gold wedding saris, and the unmarried sing and dance in their unmarried sing and dance in their brightest clothes to pray to Shiva and His consort Parvati for a long and happy marriage. They bath in the Bagmati in honor of their husbands or husbands to be. Throughout Kathmandu valley, there is feasting on the first day and fasting on the second and third. नेपाली नारीहरूकाे महान पर्व हरितालिका तिजकाे !! !हार्दिक मंगलमय शुभकामना !!! Of all things I will ever do in my lifetime, fathering my children will always be my greatest accomplishment..... And A child teaches you how to love someone more than you love yourself having fun in the park on the occasion of the Nepali women's great festival Teej congratulations all... Happy Teej !! !